Digi-Schlock: NOSFERATU THE VAMPYRE (Scream Factory Blu-Ray) – Schlockmania! Shout! Factory attracted a lot of attention last year when it announced it had made a deal with Werner Herzog’s production company to distribute several of his classic films on home video in the U.S. The first release in this series is Nosferatu The Vampyre, appropriately handled through Shout’s sublabel Scream Factory. The high-definition master used here is clean and colorful but it has also shows a noticeable amount of digital noise reduction. As a result, the level of detail is sometimes softer than it should be, particular when dealing with fine textures like skin. The result is still plenty watchable but viewers with larger monitors may notice this issue more acutely. Both the English and German versions of the film are here, with the latter looking a bit more robust. In terms of audio, the German version of the film receives both 5.1 and 2.0 lossless stereo tracks while the English version has just the 2.0 lossless stereo track. The 5.1 German and 2.0 English stereo tracks were listened to for this review and both sound quite good, with a solid blend of elements on both. The 5.1 track is subtle in terms of surround effects but spreads out the soundtrack’s blend of Popul Vuh and classical cues to hypnotic effect. Scream Factory also supplies a set of extras for this set. On the German version of the film, there are not one but two commentary tracks with Herzog. The German track is moderated by Herzog friend/collaborator Laurens Straub and is a consistently engaging track, with Herzog providing a scene-by-scene analysic packed with factoids and observations. He discusses playing with horror genre rules, the painters that influenced the imagery and how he and other German filmmakers of his era had to rebuild their cinematic culture in the wake of WWII. He also praises Kinski and the melancholy he brought to the title role while also admitting how difficult he was to handle. The English commentary track pairs Herzog with a new moderator, Norman Hill. There is a lot of overlap between it and the German track but fans will find it worth listening to as there are some interesting new tangents added to the familiar topics. For instance, he discusses how he felt Nosferatu allowed him to reconnect to the cinematic legacy of his “grandfathers” like Murnau and Lang. He also reveals how landscape and transition are as important as the actual storyline and even points out the unique place he makes a cameo in the film. Elsewhere on the disc, there is a designated special features area that contains the rest of the extras. It starts with a vintage making-of piece that is a must-watch for the film’s fans. Herzog dominates the piece with his philosophizing about German filmmaking and the role of pain in art. These is also plenty of on-set footage and even a few snippets of Klaus Kinski in the makeup chair, complete with his statements about the film in voiceover. There is also a reel of three theatrical trailers: two U.S. spots offer the same classic horror-style trailer with and without narration while a third spot is more artsy with a series of optically manipulated stills. Finally, there is a still gallery that mixes in plenty of great on-set photos, most of them with Herzog, alongside the expected stills. 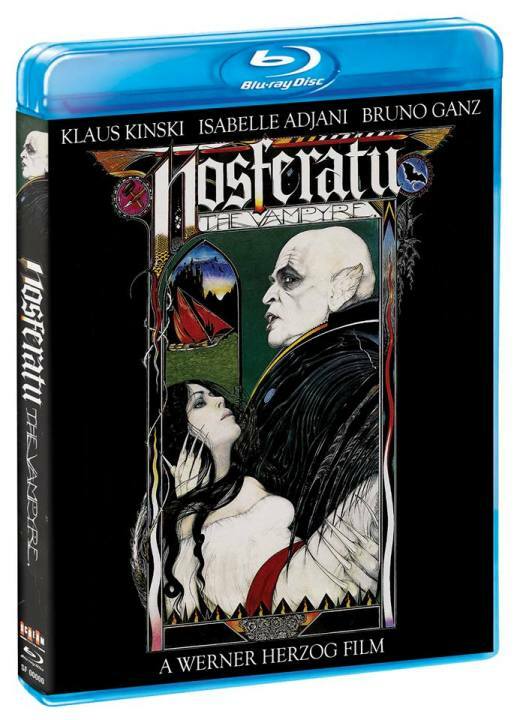 In short, Scream Factory’s blu-ray edition of Nosferatu The Vampyre is good but not great. The transfer isn’t as strong as it could be due to the DNR but it remains watchable and has a nice little set of extras. To read Schlockmania’s film review of Nosferatu The Vampyre, click here.